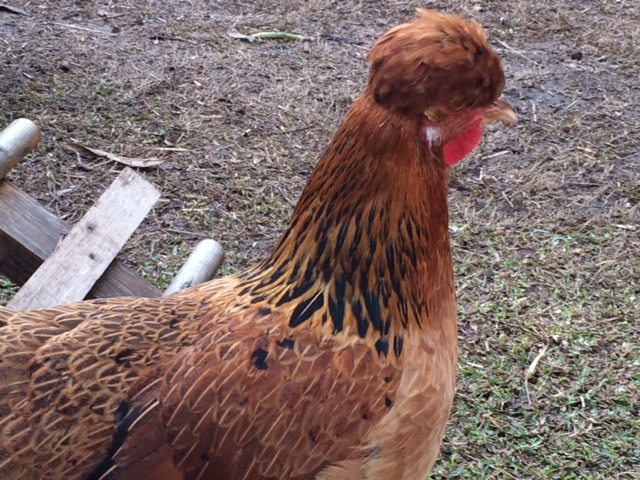 … our very own ‘Julia Gillard’ chicken! So, what has been happening and who the hell is Queen Mab? Well, a couple of months ago our rather gorgeous blue-gold Barnvelder, Ophelia, suddenly became unwell and within 24 hours was obviously struggling. A trip to the vet (and one autopsy later) revealed she had some sort of constriction/infection in her reproductive system and that was impacting her breathing. It’s so sad—she had just started to mature and was a lovely, lively bird! Our flock now reduced to five, we felt the need to fill a gap, and really, eight chickens isn’t too many, is it? So off to Beautiful Chickens with my son (home on holidays) in tow. To the strains of some fabulous 1920s sing-along on the radio we headed to Sanford. I guess this is not the high season for chicken stocks and so the selection process was less frenzied than last time—there was no need to run around in a pen full of chooks and mud, lunging at the nearest feathered object. We returned home with two gold Barnvelders and a ‘cross’. Alex had been given the approved list of names (female characters from Shakespearian plays) and on release we christened them. Our two new beautiful Barnvelders are Miranda (Prospero’s daughter in The Tempest) and Cordelia from King Lear. Sadly they are a little hard to tell apart, and are sometimes referred to as ‘the twins’ but like all Barnvelders, they have lovely ‘painted’ feathers. And what of Queen Mab? She can be found listed in the dramatise personae of Romeo and Juliet. I don’t know a lot about breeds, but my guess she is an interesting mix that includes a New Hampshire and a Frizzle—or at least something with a hairdo/can-do attitude! 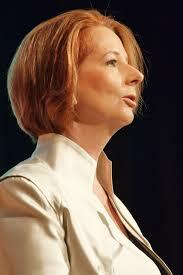 Side on, she reminds me a lot of our first female Prime Minister, Julia Gillard who was known for many things, including a speech that went viral on misogyny, and was often drawn in caricature highlighting her pronounced features and red hair. Thanks Dan 😀 I shall see about creating more stories as soon as I can—and looking forward to reading about your adventures too!